Leaders Bayern Munich hit four first-half goals against Stuttgart to earn an 11th win in 12 Bundesliga matches and move eight points clear at the top. Arjen Robben and Douglas Costa both scored in the first 17 minutes for Pep Guardiola's team, who beat Arsenal 5-1 in the Champions League on Wednesday. Filip Kostic hit the crossbar for Stuttgart before Thomas Muller set up Robert Lewandowski to tap in a third. Muller added a fourth after Arturo Vidal had headed against the bar. 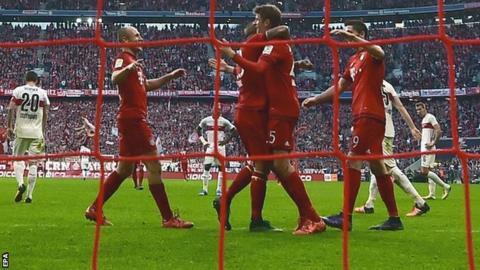 The victory ensured a return to winning domestic form for Bayern, who had won their first 10 Bundesliga matches of the season before being held 0-0 at Eintracht Frankfurt eight days ago. Stuttgart goalkeeper Przemyslaw Tyton made several excellent first-half saves to keep the score down, and denied Kingsley Coman and Lewandowski further goals after the interval. Third-placed Wolfsburg, beaten at PSV Eindhoven in the Champions League in midweek, lost Julian Draxler to a first-half red card as they lost 2-0 at Mainz, for whom Pablo De Blassis and Yunus Malli scored. Borussia Monchengladbach, who had won six Bundesliga matches in a row after losing their opening five league games, survived the late sending off of Swiss midfielder Granit Xhaka to earn a 0-0 draw at home to Ingolstadt. Match ends, FC Bayern München 4, VfB Stuttgart 0. Second Half ends, FC Bayern München 4, VfB Stuttgart 0. Philip Heise (VfB Stuttgart) wins a free kick in the defensive half. Attempt missed. Arjen Robben (FC Bayern München) left footed shot from the centre of the box is close, but misses to the left. Foul by Mart Ristl (VfB Stuttgart). Substitution, VfB Stuttgart. Mart Ristl replaces Geoffroy Serey Dié. Attempt blocked. Arturo Vidal (FC Bayern München) right footed shot from outside the box is blocked. David Alaba (FC Bayern München) wins a free kick in the attacking half. Foul by Geoffroy Serey Dié (VfB Stuttgart). Attempt missed. Thiago Alcántara (FC Bayern München) right footed shot from outside the box is just a bit too high. Assisted by David Alaba. Delay in match Arturo Vidal (FC Bayern München) because of an injury. Philip Heise (VfB Stuttgart) wins a free kick on the left wing. Foul by Arjen Robben (FC Bayern München). Geoffroy Serey Dié (VfB Stuttgart) wins a free kick in the defensive half. Attempt missed. Arjen Robben (FC Bayern München) left footed shot from the right side of the box is close, but misses to the left. Assisted by Arturo Vidal. Offside, VfB Stuttgart. Daniel Didavi tries a through ball, but Philip Heise is caught offside. Offside, VfB Stuttgart. Daniel Didavi tries a through ball, but Timo Werner is caught offside. Offside, VfB Stuttgart. Philip Heise tries a through ball, but Timo Werner is caught offside. Substitution, FC Bayern München. Thiago Alcántara replaces Douglas Costa. Offside, FC Bayern München. Arjen Robben tries a through ball, but Robert Lewandowski is caught offside. Foul by Adam Hlousek (VfB Stuttgart). Attempt saved. Robert Lewandowski (FC Bayern München) left footed shot from the left side of the box is saved in the bottom left corner. Assisted by Kingsley Coman. Arjen Robben (FC Bayern München) wins a free kick in the defensive half. Foul by Philip Heise (VfB Stuttgart). Attempt saved. Philip Heise (VfB Stuttgart) left footed shot from the centre of the box is saved in the centre of the goal. Assisted by Daniel Didavi.